Ogenki desuka? You have definitely become much stronger since my previous letter to you. The deafening cries that erupted following the long-awaited passing of the goal - the one and only which many teams have bled, sweated and teared for - resonated with me just as profoundly even though I was watching the race at the comfort of my room. Promises are easy to make, yet difficult to realise. 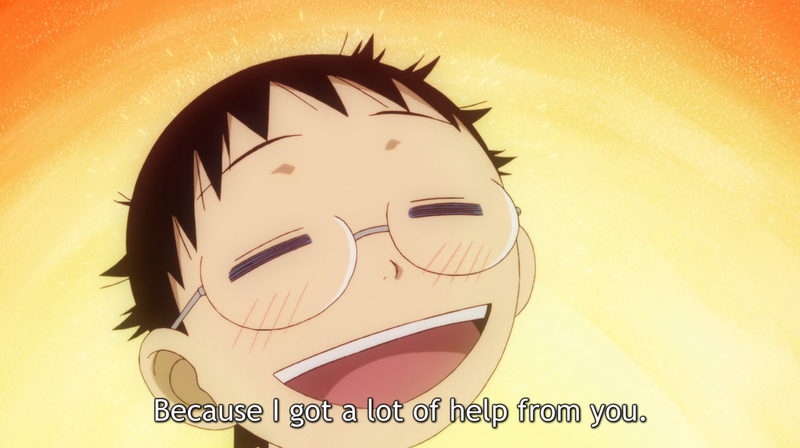 The burning desire to bring each jersey past the finishing line could only be fulfilled by one person - the ultimate Winner - and I'm elated and proud that he is none other than you, Team Sohoku #176 - Onoda Sakamichi! Congratulations, you have brought the team's jersey across the Inter-High. No other words seem able to describe that moment, but your shout of victory has done it. The remaining ounce of energy boosted your trembling hands as the three-day tournament came to an end. Well-done! 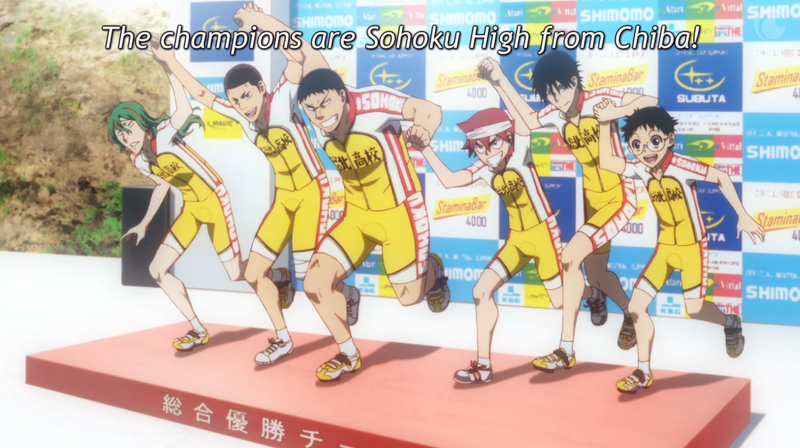 You have continued to lend weight as Team Sohoku's pillar of support through many physical and mental obstacles. I must have said that to you countless times, but I'm sure your friends and seniors will agree on just how strong an impact your presence has triggered over those three days. The inner climbing monster is merely a starter for the relentless pursuit manifested through sheer determination and such is what truly ignites the force which puts out the rest of the opponents. 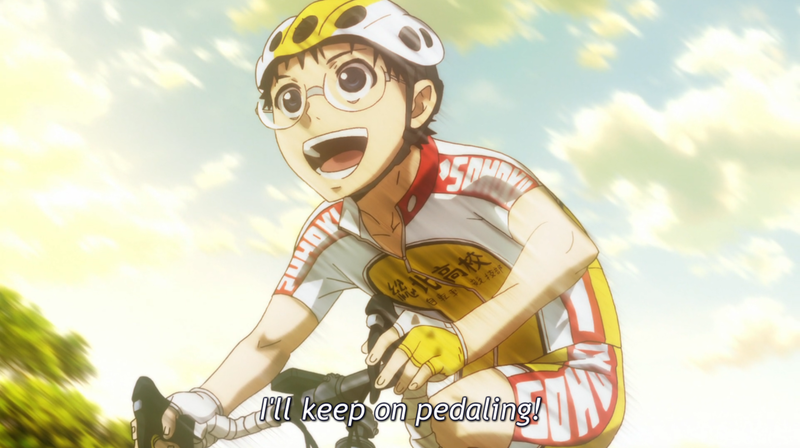 I'm certain that you and Manami will become much closer after this race. After all, he seems like the only person among the rival teams who doesn't go around cracking kunckles while looking to bite people's heads off. Well, that is more of a figurative remark but in my heart, your initial encounter with Manami has already laid out the essential foundation of a long-lasting friendship. I don't think that there would ever be a second sight like that - you and Manami were genuinely smiling at each other at the end of the race. Most people would probably resemble dead fishes. The winners' platform may only be 15 centimetres tall, but echoing what the seniors have said, the greatest height there is. 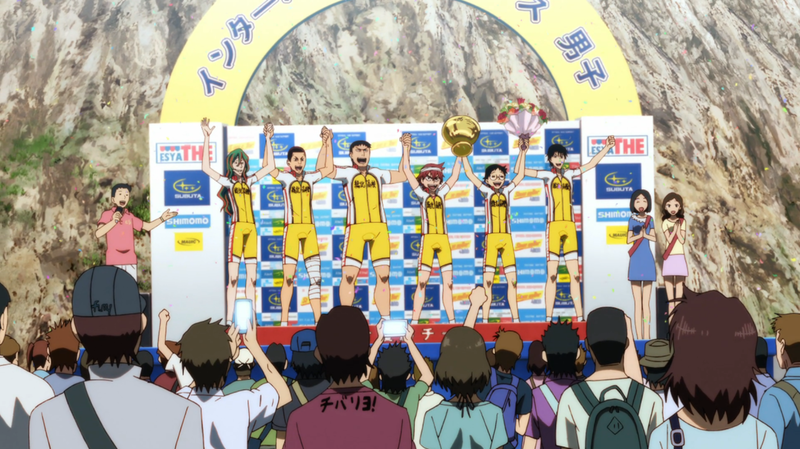 I have to say though that I was a little taken aback by Makishima-senpai's out-of-character emotional outburst as the team stood proudly with the winner's cup and bouquet. 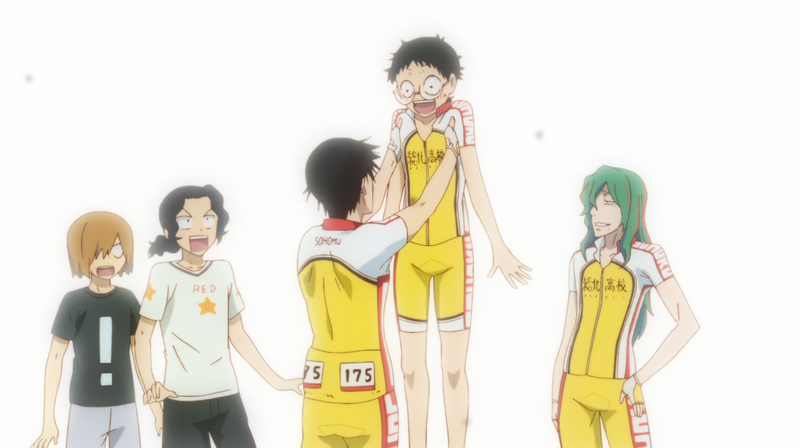 Even Kinjou-senpai and Tadokoro-senpai couldn't believe what they had seen! Well, I suppose that a little off-tune (?) is acceptable. 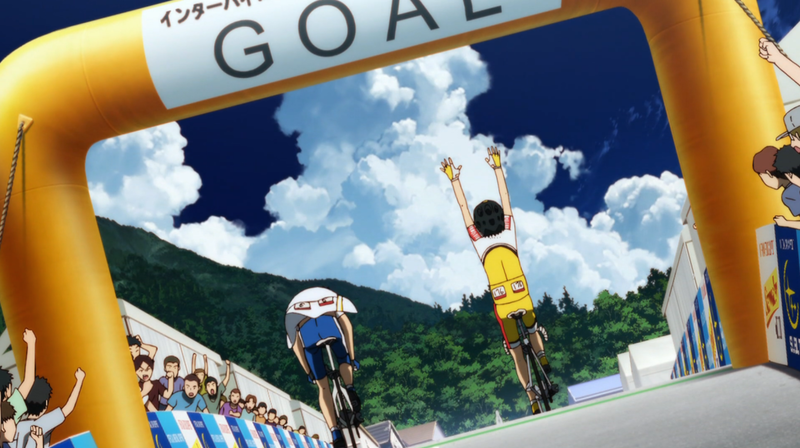 It was nice of Team Hakone Gakuen to applaud you guys. For a second, Manami was still feeling a little lost (absolutely no pun intended). But we all know that he will be fine! Oh, while I wasn't expecting that cycling trip with Team Sohoku to Akihabara, I did realise that it actually tied in to what you had wished for right at the beginning of the series - you had wanted to visit Akihabara with your friends. Even though there was still a difference, it wasn't a glaring one at least. The seniors' awkwardness throughout the trip was refreshingly hilarious! I was moved by your little but powerful confession at the end. Yeah, you have indeed come a long way. From an otaku to a full-fledged road racer demands a lot of sacrifices, but you have managed to pull through all the obstacles with your trademark smile. Please keep smiling for yourself and Team Sohoku. Every team needs somebody like you! If there ever would be a third season, I would most definitely root for Team Sohoku again! Meanwhile, I shall miss you guys really badly. Take care, and thank you. 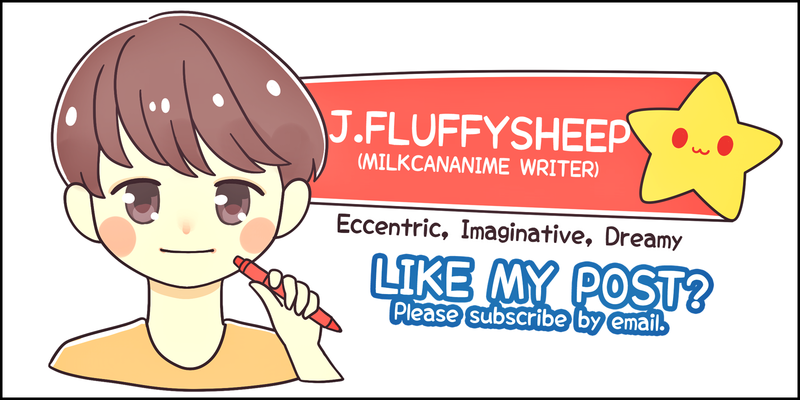 No Comment to " A Third Letter To Sakamichi "